Applecross Rotary seeks, and assists, local young people apply for Rotary organised programs in Western Australia and elsewhere in Australia and provides financial support for the successful applicants. These include programs for handicapped youth, for leadership training, for speech competitions and for participation in science forums. Applecross Rotary also supports a mentoring program for young people in Western Australian country regions and supports an indigenous student undertaking higher education. Young people who are interested in nominating for any of the programs should contact the Rotary Club of Applecross Youth Director . Applecross Rotary supported True Blue Dreaming in 2016-17 and 2017-18. True Blue Dreaming, is committed to supporting and strengthening young lives in rural and remote Australian communities. Their programs have been successfully delivered in the Wheatbelt, Kimberley and Pilbara regions of Western Australia since 2004. True Blue Dreaming Inc. is a registered not for profit charity. Applecross Rotary has donated to True Blue Dreaming Inc. to support ongoing mentoring programs in the WA wheatbelt towns of Bruce Rock and Wyalkatchem. The Rotary Youth Leadership Award (RYLA) is a challenging 7-day program which provides a unique opportunity for leadership skills development. Rotary supports young people between the ages of 18 and 28 who have the talent, energy and motivation to discover their leadership potential!. More information about the program is available. Applecross Rotary seeks nominations from young adults with proven leadership experience and potential leaders from diverse backgrounds. The seminar program, which is run each January, has a strong focus on personal and leadership development. Nominations close in November. Interested young people are encouraged to seek further information and contact the Club’s Youth Director. More information about previous awardees is available. Awardee for 2019 Kate Dee pictured with President Ian Fairnie and Youth Director Suresh Prabhakaran. 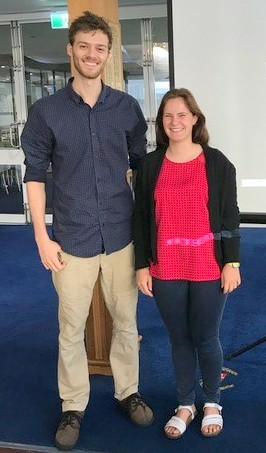 Applecross Rotary awardees for 2018 were Adam Luce and Claire Palmer. The National Youth Science Forums are two-week programs in January at Universities around Australia. The forum is for students moving into Year 12 who are thinking about a career in science, engineering and technology. The program has attracted over 10,000 students since its inception. Students are introduced to research and researchers, by encouraging the achievement of excellence in all their undertakings and by helping to develop their communication and interpersonal skills. It also fosters discussion of and interest in major national and global issues and emphasises the importance of maintaining continuing active interest in sport, arts and music. More information is available. Interested Young people who live or go to school in the City of Melville are invited to contact the Club’s Youth Director for more information. 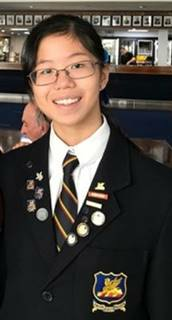 to the National Youth Science Forum in Brisbane in January 2018. 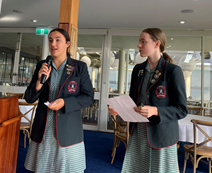 Read more about Applecross Rotary sponsored students. Handicamp: A week full of fun and challenges, and a lifetime of experiences. Handicamp provides an opportunity for young people with a disability and between the ages of 18-35, to attend a one-week live-in camp assisted by staff and buddies. Applications open on 1 October for the camp which is held in mid-January of the following year for both campers and buddies. Handicamp is a week long live in camp for 18 to 35 year old people with disability, who are teamed with a "buddy" for a week of fun and adventure. The camp is based on double participation and reward, supervised by a volunteer Rotary committee and nursing support. Interested Young people who live, go to school or work in the City of Melville are invited to contact the Club’s Youth Director. Applecross Rotary regularly supports participants to Handicamp. Read more. Rotary Youth Programme of Enrichment (RYPEN) is a weekend live in seminar for up to 45 participants aged from 15 to 17 years which aims to create in young adults an awareness of their place in and responsibility towards, society. Applecross Rotary sponsors and pays for selected participates who see RYPEN as a great opportunity to demonstrate their commitment to youth in their community. Read More.